May you enjoy and be inspired by the music, prose, images and gratitude you find here from our Beach Dances. Visit often to discover new songs to love, words to stir your soul, photographs to appreciate beauty and overall goodness about the people who come to Beach Dance and what this experience is really all about. Every Beach Dance begins and ends in a circle. We stand together, more often than not holding each others’ hands and from this perspective, we are able to see everyone who is a part of the dance. From this perspective, we open and close our dance experience by honoring all those who showed up for it through our eyes, ears and hearts. These circles mean the world to me. I’ve often said to participants that the circle is just as important as the music part of the dance is. It’s a shape I ask people to take before and after our dance because it allows us to witness one another whether we speak or not. It gives everyone an opportunity to see and be seen, hear and be heard and to just be together in the anticipation and excitement at the beginning and in the afterglow and sharing at the ending . My friend, Gail shared these words with me in December during a phone conversation after I told her about my decision to leave Facebook at the end of the year. They struck a chord with me back then and they continue to intrigue me as well as reaffirm my choice to let that particular social media go for now and possibly for good. Gail’s words speak to something that is truly disturbing about our online world. Specifically speaking about Facebook, we scroll past true humanity ALL THE TIME. I know I certainly did. There were so many posts and news articles about personal dilemmas, social dramas and world crises that at times, I would become overwhelmed by it all and just scroll on by the things that shocked me or made me feel terribly sad or angry and I would just continue on down the feed until a funny cat video was found. I began to feel a tinge of guilt whenever I would read someone’s honest and heart-breaking/opening story of their lives and then not comment on it. While it was easy to scroll on past ads and inane posts about what someone was having for dinner, I felt horrid pretty much every time I read something extremely personal and didn’t take the time to let the person know I had seen their post, that I had seen them through their words. I equally felt horrid when I would write something very personal and no one would comment or would just leave a thumbs-up. In my world, emoticons are not real communication and real communication is what I crave - the kind where you linger awhile, the kind where you cannot scroll on past. True humanity cannot be scrolled past. True humanity, which I’ll name as our vulnerable, courageously messy and often messed-up, compassionate selves, wants and needs to be seen and heard, valued and loved, experienced and remembered. If you find yourself scrolling past stories and experiences of true humanity whether they’re happening online or right in front of you, consider how you feel when others scroll past you. Consider staying for awhile and offering up your felt presence. True humanity happens in our circles every weekend. It’s a shape I’ve come to adore every Sunday morning for its beautiful simplicity and its profound ability to keep opening us up to the ways in which we see and experience others and ourselves. Come and join us some Sunday. Come and stand in our circle of true humanity. During the month of December, every event was dedicated to a particular gift that dance brings us and that we bring to the dance. They were delicious (the gift of the sacred sensual), diverse (the gift of music from around the world), distinctly different (the gift of the unexpected), delightful (the gift of joy) and deliberate and deep (the gift of letting go and moving on). It was a beautiful month of five Sunday dances and one special sunset dance to celebrate Lila’s 50th birthday. There were many more gifts that were danced and shared among all those who gathered, but the one I’ll remember most occurred on the last dance of the year. There were 47 working iPods and 60 people showed up. 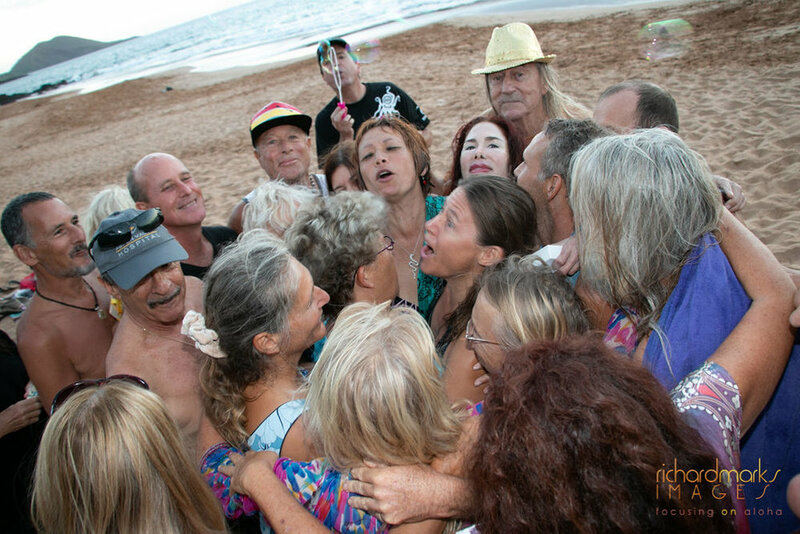 Several of the folks who came were there for the first time and would experience their first Beach Dance without music. It was not the first time I’d felt sad we’d run out of iPods and that some people would not have them. I had promised myself I would not have more than 50 iPods due to the work involved, but by the end of this dance I changed my mind because of what happened at the very beginning of it. As our opening circle began, I pointed out the dilemma of not having enough iPods for everyone and that some of the new people who had come did not have one. And then a possibility showed up that I had to act on. I wondered what would happen if I just asked some of the folks who attend on a regular basis to consider for a moment if they would be willing to gift their iPod to a new participant. So I asked and the best gift slowly and then steadily unwrapped itself in front of all of us. Someone with an iPod stepped into the middle of the circle and offered it up to someone who didn’t have one. And then another person stepped in and then another and the great iPod exchange continued until we were all left in either smiles or tears over the beauty and grace of it all. I will never forget the generosity that was shown and shared on that day. I think everyone who was there to witness and participate in what took place experienced a deep sense of gratitude and awe. It truly was a dance of significant magnificence. For those dancers who moved without an iPod that day (although I have no doubts that you were listening to a special kind of music), here is our playlist for you and for all those who have found/made their way to the website. As this new year begins, may we continue to be in the dance of letting go and moving on each and every day. Since returning home to Maui in August, nine Beach Dances have been had. Nine beautiful gatherings of people moving about on mother nature’s dance floor and fluid ocean. Nine Sunday mornings and one special Thursday morning of being with our dance and with each other and belonging to something greater than all the parts that make Beach Dance what it is. What exactly is that something greater? Well…that’s a question to ponder, isn’t it? And while I’m no expert, I’ll do my best to answer it given my experience as a dancer for a few decades and having facilitated Beach Dance for over ten years now. That something greater is genuine presence, acceptance and love. It’s a palpable feeling that people sense and experience not just from me, the facilitator, but from everyone who attends. It’s what we create and share together that makes it greater than each one of us alone. We’re a gorgeous gang of eclectic movers and shakers. We’re a sweet community that trusts each other. We’re a family without bloodlines, but with embodied connections. There are six dances left in 2018. How will you dance the last month of this year? Might you want to dance ‘that something greater’ within you as you navigate through the upcoming holidays? If it’s a yes, come and dance with us on a Sunday morning or every Sunday morning. If you don’t live on Maui (or if you do, however you can’t put one more event on your December schedule), you don’t have to go anywhere and can dance in the comfort of your own home by choosing one of the playlists here. Scroll down further on this page! Last, but not least…I’m celebrating my 50th this month with a couple of on and off-this- island adventures and I’m having a special sunset Beach Dance on Wednesday, December 12, the eve of my birthday. I’d love to have you join in the fun. You can check out the invitation here and rsvp a spot. However it is that you and your family and friends celebrate the holidays, may they be beautiful times of togetherness. transformed into the shape you now carry. devoted itself to the dance known as your heartbeat. changed forever by that first gulp of air. In early November, I attended Patti Digh’s Life is a Verb Camp and offered dance every morning as part of the ‘Becoming Bendy’ program. Why would I trade a sunny warm beach dancing in a bikini on Maui for a weekend of dancing beside a lake in much cooler temperatures outside Asheville, North Carolina while all bundled-up in a sweater, jacket, hat and gloves? Well…because this is no ordinary camp. For the past six years, the first week of November has been a beacon for hundreds of people scattered across the United States to gather for a few days to celebrate courage, creativity, community and compassion together. It’s no easy task to put on an event for 137 people (that’s the maximum amount of folks who can come each year and there’s a few reasons for that), but with the help and support of all those who attend, this camp has become an extraordinary collaborative tribe of eclectic souls who excel at having fun and honoring each other for who they really are. I’ve attended four of the six camps. I’ll keep on attending it every year because I admire the woman who created this love-fest, I adore all the people who come to this event and I believe in the importance of belonging to something greater than oneself. For a few days every Autumn, Beach Dance happens where the trees are various shades of red, orange and yellow and where the people wear a lot more clothes when they dance. This is a beautiful thing. If you’re an LIAV camper who danced in the morning, may you enjoy the music again. If you slept in, went to yoga, enjoyed your first cup of coffee in silence and solitude before the day began, may you happily dance to our playlists for the first time and as your body moves, may fond memories of your time at camp remind you to keep being courageous, find joy in your daily life and remember you are wholly holy 24/7, 365. If you’re a regular Beach Dancer on Maui or a visitor who happened to come across this website, well…what are you waiting for? Have a listen to our camp playlists by pushing the play button and start dancing! Early morning lake dancing at Life is a Verb Camp 2018 located at Kanuga Conference and Retreat Center. I am grateful to begin every Sunday morning with dance. To see people gather to celebrate movement, creative expression and community every weekend is a beautiful thing. To see the same thing happen on a national holiday this past Thursday (Thanksgiving) was truly touching. Indeed, it was a gathering of gratitude. Enjoy the poem that began our playlist. Enjoy this dance! Ecstatic dance or conscious movement is created from and happens with intention. And this past Sunday’s dance was a full-on, hour of music that was intentionally-created for our own healing and collective empowerment. Every song was meant to evoke a feeling and/or an emotion. Every song was especially selected as a statement/sentiment to impact the body, touch the heart and stir the soul. I’ll have much more to say in my next newsletter about how important our own individual dance and our dance together is right now at this time in our nation’s and world’s history. For now, I’ll say this- We MUST have something in our lives that we can turn to for inspiration, solace and belonging. For us as human beings to not just survive, but thrive within the absolute chaos that surrounds us politically, socially and environmentally, we not only need a personal practice to steady ourselves, but we need a supportive community we can immerse ourselves in. Forty-seven people came together this past Sunday and danced their bodies, touched each other’s hearts and shared their souls. It was a much-needed release of energy for many of us. It was, and I don’t use this term often or lightly, EPIC! We danced being our own heroes. I invite you to listen to this playlist and dance your own. The next Beach Dance will happen on Sunday, October 21. There is NO DANCE this Sunday, October 14 as I will be off island dancing and writing at Breitenbush Hot Springs. I look forward to immersing with you again next weekend. Steady on, friends. The new day begins with birdsong. understanding nothing appears as it seems. The familiar face stares back in the mirror. The hopeful heart is open. The wise soul understands patience. realizing home has always been within. The truth of life is love. remembering I AM that sweet something every day. It was all about self love. And then it was about love of others. And then it was simply loving it all. After being away for four months...It was a sweet homecoming. mahalo to all of you who came and danced. are sung in such dissonant tones." under the guise of good will." such harm upon each other." i'll do my best to sing together. i will speak words that foster empathy. i will forgive over and over again. of everything i'm attached to. and you will see my soul. "I'm so sorry I forgot how much you mean to me"? are better ones and are kept. "I'm so sorry I forgot how lovely you are"? of the entire world in a face. as much as I do"? we realize we want the same things. "I'm so sorry I forgot who you really are. Please come in"?